Dinosaur Comics - January 9th, 2013 - awesome fun times! 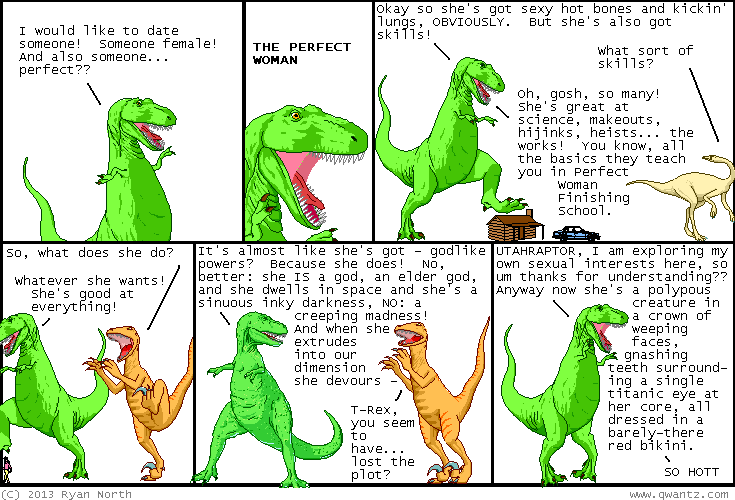 January 9th, 2013: So Marshall has created a site that mashes up Dinosaur Comics (the site you're reading!) with Horse_ebooks (the best/most insane automatically-generated Twitter account ever!) into this site, which puts one AUTHENTIC panel 2 next to one taken from horse_ebooks. It is kinda brilliant? Refresh for another one! One year ago today: that last panel is a bit of a downer but what are you gonna do? make a MURDER JOKE?? ?